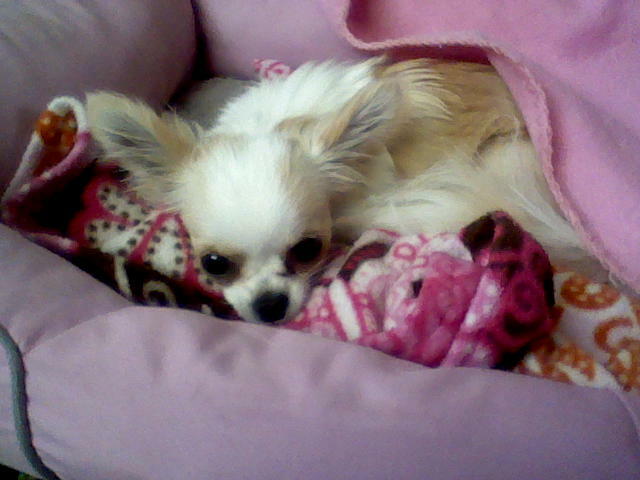 It was Nikki of Obsessive Chihuahua Disorder who pointed out the Swarovski-studded toidy. 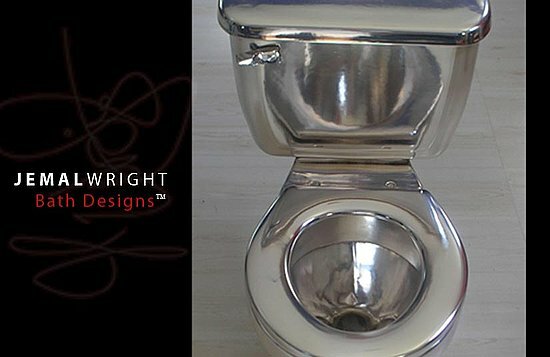 Now, this strikes me as inherently unhygienic, but the article mentions that the same maker came up with a chrome toilet, and I love that idea. I think I’d have to make “vroom noises” while sitting on it. 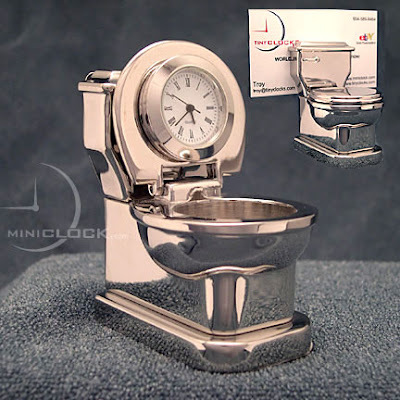 Now, if your commode budget doesn’t stretch to the tens of thousands, may I suggest this small chrome toilet with a clock in the seat, which is also a business card holder. I’m trying to think of an appropriate use for this sucker… Reminder card for your gastroenterologist appointment? Sales rep for a hangover cure? Bulemia support group? Help me out here. It all began yesterday, as I stood in line at the Post Office. I checked my voice mail and there was a message from Dreux (pronounced Drew) DeMack, a producer at COCO (Colorado and Company), Denver’s Channel 9 morning show. Hi, Esri! 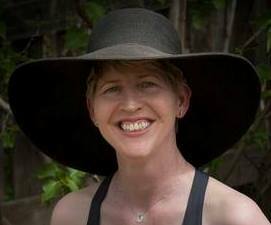 We were wondering if you could be on the show tomorrow to talk about The Portrait of Doreene Gray. Eek! The message had been left at 11:00 that morning, and now it was 3:30. Due to a surfeit of stupid political calls, I’d been ignoring unknown numbers. I called back and told Dreux’s voice mail I’d be overjoyed to come. Then I rushed home and washed Josie O. Then I rushed to Nordstrom Rack and bought a cute new dress, suitable for TV. But I didn’t hear from Dreux the rest of the day. I resisted the urge to beat my head against the wall. Now that I’d missed this chance, would they call again? The next morning, today, I woke up around ten to eight and dialed Dreux’s number, just in case. He picked up. Hi, Esri, I just walked in the office. Sorry I didn’t get your voice mail yesterday, but we’d still like to have you on today. Did you get the message I left on your phone about an hour ago? I hadn’t, but the upshot was that they wanted Josie O and me there sometime between 9:30 and 9:45. It was now eight o’clock. I had an hour and a half to get myself and Josie ready and drive to Denver during the tail end of rush hour. No problem, Dreux! I’ll be there! Step 1. Drink a cup of soy milk to avoid passing out from low blood sugar. Step 2. Careful grooming: Brush teeth. Wet ridiculous bed head. Attempt style with super big bobby pins. Give up and pomade it into submission. Put a whole crap load of make up on, and the aforementioned dress. Step 3. Get Josie’s stuff together. Sweater dress, toys, treats, food, water bottle, leash, ohmygod why does this dog have so much stuff? Step 4. Drive to Denver. We made it there at 9:20 or so – plenty of time for Josie to have a wee on the manicured lawn and for me to sign in and get my visitor’s tag. Dreux came out and met me, and was just as warm and welcoming as last year. Great guy. This time, I was with the regular host, Denise Plante, a tall, gorgeous creature with boots I wanted to steal right off her shapely legs. I refrained. It’s chilly in a TV studio, except on the set proper, which is warmed by those bright, bright lights. Josie O sat quietly in her carrier while I reviewed my script and went over my answers to questions. Up on the set, Denise talked with guests about new treatments for thyroid problems and low mortgages. Dreux wandered over and looked down at Josie, who was napping. Me: Next time, you’ll have her on and skip me. Denise gave me a lovely introduction, read the blurb for my book, and then asked about Josie. As I answered, I put Josie on the floor and had her do a spin, then picked her back up and took her sweater off, so she wouldn’t get warm and fuss. We only had about five minutes, and she sat quietly in my lap the whole time, being cute, which is her job. Then we were done, and it was time to pack up. I asked Drew when the show would air. Didn’t I mention? This was live. We’ll probably run it again, though, because it’s general. I’ll let you know any subsequent air dates. Remind me to send you a DVD of your segment. So there it was, my second time on COCO and Josie’s first. As before, I did fine, but I also could have done better. Short appearances are a real art, and it’s hard to stay tightly on message. But hey, I had a cute dog with me. If you’re interested in Josie’s sweater, you can find it at The Doggie Market on Etsy.com. Just click here. Actual things I have said to my dog. It would be kinder to eat that from the head down. You have very poor impulse control. See? Mommy doesn’t eat her poop. Wake up and be cute. And as a bonus, one from Angel Joe. You’re kind of prissy for a cat puke and poo eater. The Tooth Fairy left a dime, but Josie didn’t know how to spend it. Yesterday, Josie O was gnawing away on a beef tendon while Joe and I looked on dotingly. Suddenly she started doing that peanut butter stuck to the roof of the mouth thing. Me: She must have a piece of tendon stuck on her teeth. Me: Aren’t you gonna eat it? You worked so hard to chew it off. Joe: (puts bit of stuff on finger tip, offers it to Josie) Wait a minute, it’s a tooth! So Josie, who still has some gaps in her mouth arsenal at 10 months, is still cutting teeth. Josie O, Bite Free for  Day(s)! I don’t know if Josie really got stung by a wasp yesterday or not. She napped most of the day, and when her eensy dose o’ Benadryl wore off, she was as lively as ever, with no limp or sign that anything had happened. I never saw any swelling, so for all I know, she just stepped on something sharp. Regardless, she got a restful day out of it. When Josie was at her most pitiful, I put Musette down next to her bed, to see if maybe she’d be sympathetic. Josie O learns about stinging insects. Josie and I were outside when she suddenly let out a yip and ran for me and the front door, in that order, whimpering and holding up her left front paw. She’s been interested in the bees and wasps, so I figured she got stung. Don’t know what kind of bug it was, but the first-aid instructions are the same. Good thing it wasn’t her face, or we’d be at the vet right now. So far her paw isn’t swollen very much at all. For all I know, it was an ant. I gave Josie O my Popsicle stick to chew on while we were on the porch, and after a few licks, she accidentally pushed it through the crack between two boards and it was gone. She stared down in the exact manner of a kid holding an empty ice-cream cone. I put the tuffet on the floor behind my desk chair so Josie O could keep me company if she wanted, then forgot all about it. Turned around and this is what I saw. 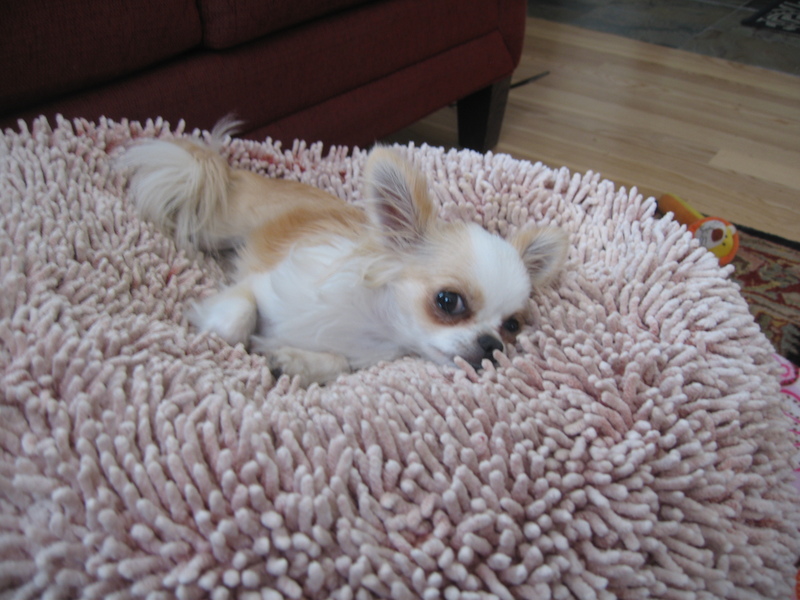 Posted in Chihuahuas, Josie O. Just want to take a moment to pimp fellow mystery author Steve Hockensmith, who writes a bunch of stuff, including the Holmes on the Range series, which I love. In his recent blog post, he writes about the art of the short story. Recently, I decided to try watching Battlestar Galactica. Angel Joe and I never saw it when it was current, and we haven’t watched Sci Fi in ages, but Battlestar Galactica is mentioned so often on The Big Bang Theory that I thought we should give it a try. My verdict: I was fascinated by the whole Cylon premise, but disliked the unremitting violence. It’s all, Pow, pow, kaboom! Yell, yell, yell! and Thwack, thwack, blood. But Joe wanted to keep watching it. Now, he’s never been into that kind of thing, and I suspect there’s something else going on — namely, he’s found something he likes reasonably well that I don’t, and this allows him to watch without my constant interruptions. My dad and I are the same way. We need the video paused while we have a snack, a drink, a pee, a little tidy, some petting of the critters, whereas Joe can lie on his shoulder blades for three hours straight. The divot halfway down the back of our sofa is from his head. So we compromised. Joe watches BG with headphones on while I putter around doing other stuff, and I ask him about the Cylons later on. So a couple of nights ago, he was watching BG and I was upstairs experimenting with a new singing persona, slapping on new make-up over old, taking pictures in the unflattering LED lighting of our john, and generally achieving the look of an aging drag queen. I went downstairs for something, and instead of blessed silence, I heard the hissing of water coming from somewhere it shouldn’t — namely, from under our kitchen cabinets. A pool was spreading toward the middle of the floor. Joe (lifting one side of headphones): Yeah? Me: The kitchen is flooding. Joe turned off the water and we sprang into action. My one regret is that no one was there to film a computer geek and a woman in a tiny top hat and corset get down on their hands and knees to mop up water with microfiber dog towels. That’s the best of the story. The hose from the water filter to the refrigerator water/ice dispenser had gotten crimped under a cabinet and worn through. Joe replaced it the next day, and I’m wondering if there’s money to be made by installing webcams all over the house.